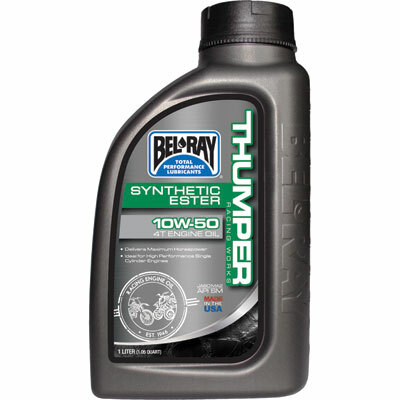 Bel-Ray® Works Thumper® Racing Full Synthetic Ester 4T Engine Oil is a 4-stroke synthetic racing oil that has been developed for full works competition use and is designed to withstand extreme racing conditions. Full synthetic ester base oils withstand the highest temperatures and stresses which provide the ultimate 4-stroke motorcycle oil. Suitable for air-cooled/liquid-cooled 4-stroke engines and wet clutches. Meets API SM and JASO MA2 requirements. For use in all 4-stroke engines with or without wet clutches. Use in Thumper engines (single cylinder, multi-valve racing engines).